Tivoli Andiamo Bluetooth speaker review | What Hi-Fi? 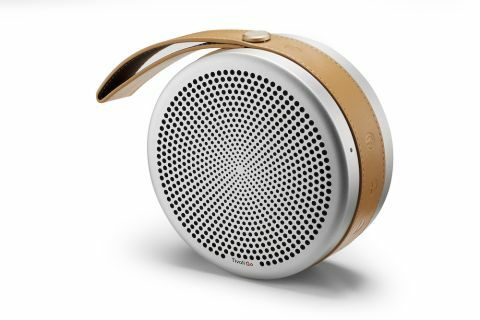 Take a look at Tivoli’s Andiamo wireless speaker from afar, and you would be forgiven for thinking that this is a Bang & Olufsen product. This is a lovely little piece of kit, made from lightweight but tough aluminium with leather trimmings, and nicely put together. It’s the type of ‘lifestyle’ product that we at What Hi-Fi? can sometimes struggle with when coming up with a star rating. After all, how much a product’s ‘style’ is worth to someone can be decided only by the individual, of course. We rate products on a sound per pound basis, which makes reviews of such lifestyle products tricky. Anyway, that caveat noted, let’s dive in – “Andiamo” means “let’s go” in Italian, after all. Under that aluminium casework lies a 6.5cm full-range driver and a 7.7cm passive driver to aid bass reproduction. The Andiamo uses 24-bit DSP equalization in a bid to get the best from your music streams. At its heart, this is a basic Bluetooth speaker, with no frills or added extras. It’s a reasonably small metal puck – 135mm in diameter and 55mm high. There is a 3.5mm aux-in socket for hard-wiring external sources, and the power socket for charging the battery – which is good for a claimed 20 hours of playback. Your main means of access to the Andiamo, though, will be via Bluetooth – it uses Bluetooth 3.0, which means it picks up your source promptly once it’s turned on. Control buttons are hidden neatly beneath the tooled leather strap. There are embossed icons on the strap for volume up, volume down, power and Bluetooth pairing. A push on each will activate the control hidden beneath the leather. Set-up is simple and, though this speaker is intended to be carried around – the strap is looped for easy portability – it is also designed to be right at home sitting on a table or shelf. There is a rubberised ring on its underside, upon which the Andiamo sits, and which indicates that this is the preferred way to listen to the little speaker. We link to the Andiamo via Bluetooth with our MacBook Pro, put the unit on a shelf near a wall, and fire up Tidal. And we are immediately impressed with what we hear. It may be relatively small in stature, but the Andiamo is certainly able to pack a sonic punch – and produces a sound way larger than you might have thought. It hasn’t just got decent power, though. This is a focused, snappy balanced sound, that makes for a really enjoyable listen. Bass is agile, but not overplayed, and the overriding impression here is of a speaker that knows its business – everything hangs together beautifully, timing is great, and it’s all truly musical. Nothing in the sonic spectrum stands out to the detriment of anything else, but voices are handled particularly well – Whitney Houston’s I Wanna Dance With Somebody brings a smile to the face and a tap to the toe with the sheer exhuberance of her performance. It’s a level of performance and articulation that is hard to find for this money – and it manages to convey the excitement of a track with apparent ease. Before we get too carried away, it’s worth reiterating that this is a relatively small speaker and, as such, cannot possibly provide the sort of bass reproduction that a bigger unit can. When we hold the Andiamo by its handle – and in doing so taking away the reinforcement of a nearby wall – the sound suffers accordingly. It still provides a snappy, fun sound, but it’s undoubtedly at its best on a solid surface. The Tivoli Andiamo manages to pull off the seemingly impossible, by being a beautifully put together ‘lifestyle’ product while at the same time providing a sound that comfortably matches its price. And that, we confess, is not something we thought we’d be saying when we took the little aluminium puck out of its box.